With no rain to speak of, I knew we’d be on the river today and as an added bonus when I woke the car wasn’t frosted up either. I got to the pub in time to have one of Steve’s lovely sausage sandwiches which set me up for the day and all the usual faces were there apart from Bruce who’s been poorly (get well soon mate). Rob had pegged the bottom end today and had put three in above Redbridge which would be interesting as it was the first time they’d been pegged for a while. Before he announced the draw, Rob said that there would be two golden pegs today and they were pegs 125 and 109 (or so I thought). I went into the hat and pulled out peg 109 which I was pleased with as Tony Newman had four good chub out of it to win the Xmas Fayre and he’d lost a few as well. As for my regular side bets, Steve P was on 106 above the bridge which was a bit of a unknown quantity, Hurf was on 123 at Isle Brewers which I wouldn’t have fancied if I’m honest and Baz was in the weirpool which is normally a really consistent peg and good for 7-9lb. Elsewhere Heardy was down in peg 129, Justin was in 128 and Rob had drawn 126, all great pegs and more than capable of winning. As I got to Redbridge and parked up, Fieldy and Big Frank had drawn the other two pegs above the bridge and while I didn’t think all three pegs would bag up, I did think some chub would show up there. Jake Woodard was below me in the gas pipe swim and it looked nice with plenty of cover on the far side. It took me a while to get my box level which left me rushing around a bit, I put on the deepest rig I had and lowered it in and the float just kept on going! I ended up having to tie some extra line on to make the rig four sections long which wasn’t ideal. The rig was a one gram Drennan Tipo with 0.12mm bottom and size 18 B611 and with chub in mind I coupled it to a fairly heavy green Preston elastic. The swim had two areas of cover across but on plumbing up the bottom was all over the place and it was pretty snaggy by the tree to the right so my main line would be by the cover to the left at 11.5 metres with the option of going tighter to the rubbish at 13 metres if I wasn’t getting bites. I was a few minutes late starting and shipped out with a single caster on the hook and fed some casters and maggots quite a way to the right (because of the depth) and some hemp nearly opposite. First chuck the float settled and as I inched it through, it went under and the strike saw some green elastic come out but this wasn’t a chub and I was soon slipping the net under a 6oz roach, a decent start. The next five chucks resulted in five more roach of a similar size and there were obviously a lot of fish there as some good roach were topping as well. In a bid to try and catch a bit quicker I took a section off and ran the float through in the flow, I had some more roach around 6oz and a couple of clonkers around 10-12oz and then hooked a better fish which turned out to be a chub around the pound mark. 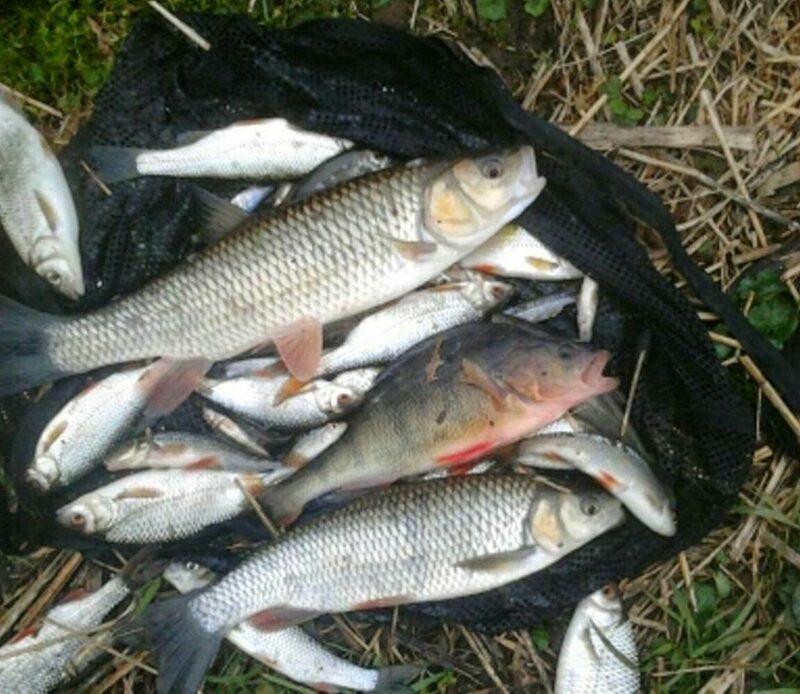 I finished the first hour with 17 fish (15 roach, a good dace and that chub) for about 5lb and if I could carry on catching at that rate it would give me around 22lb (at 4oz apiece) but I was sure it would slow at some point. The second hour was even better and I had another 21 fish, nearly all roach and I had to net the majority of them for another 5lb and I was still on target to do over 20lb. Jake had landed a chub and lost one but was struggling now. In hour three things started to slow up at 10 metres so I went a section further over and started catching roach again, a switch to double red maggot resulted in a couple of roach but then I had a gudgeon and a couple of minnows so went back to caster, the roach kept coming and I had another sixteen including four that probably went 3lb between them giving me around 6lb for that hour and if I could carry on like this, breaking my best match weight on the river was a possibility. Big Frank wandered down and said all three of them above the bridge couldn’t buy a bite and a little bit later Baz wandered up from peg 120 and said he’d only had a couple of fish, he also reported that Hurf was getting odd fish so I was doing okay but felt sure some of the better pegs at Isle Brewers (126, 128 or 129) had to be catching. During the fourth hour I had a poor spell where I lost what felt like a big roach as I shipped back, I bumped four on the trot and then had a 3oz roach drop off when I tried to swing it. While Baz was with me, my bites slowed up and he suggested trying double red maggot, first chuck the float sailed away and a good fish was on. As I got down to the top four I could see it was a good roach but it also looked foul hooked and sure enough the hook pulled out – bugger. I only added eleven fish in hour four plus a couple of minnows and gudgeon which I didn’t count and any thoughts of doing 30lb disappeared. 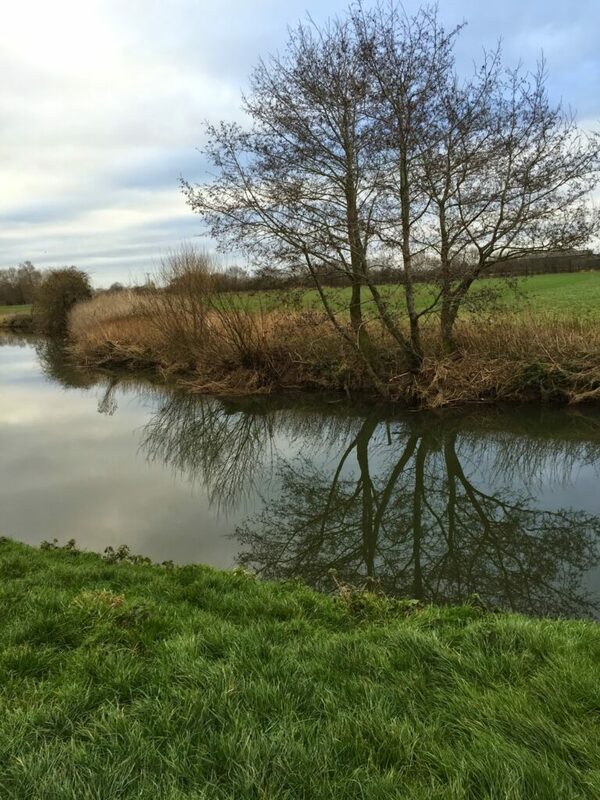 By now Fieldy, Frank and Steve P had packed up above the bridge and Frank was sat with me, while he was there a big fish rolled by the rubbish and we weren’t sure whether it was a chub or a pike which might explain sport slowing up. I tried fishing 13 metres further down the swim but to no avail and then with an hour to go and the light starting to fail, odd roach started topping again and the float started going under. Jake latched into a chub but lost it and then safely netted the next one, I was getting roach but not the netters from earlier with most of them around 2-3oz. Jake added another four chub quite quickly before it slowed up for him again. My last fish was a 12oz roach and I ended up with 80 fish which I hoped would give me 20lb. Jake had the scales but while he packed up Frank went down to weigh Baz in, I took my kit back to the car and then walked down to Jake just as Frank arrived with the scales. A quick look at the board revealed Baz had struggled for 10oz (mainly small fish!) so with Steve P taking an early bath I was 2-0 up in side bets. Jakes’s six chub went 10lb 9oz with five of them coming in the last hour and then we walked up to weigh my fish in. The first weigh went 11lb 10oz and the second weigh (pictured below) went 9lb 10oz to give me a 21lb 4oz total but would it be enough. The photo doesn’t really do the roach justice and they were beautiful, mint fish that looked like they’d never been caught before. Back at the results and Rob had the top weight at Isle Brewers with 11lb 11oz from peg 126 which meant I’d won and I was looking forward to a bumper payday. Jake was third which meant Baz won his section with 10oz!, they say it’s better to be lucky then good, the trouble is, Baz is both! 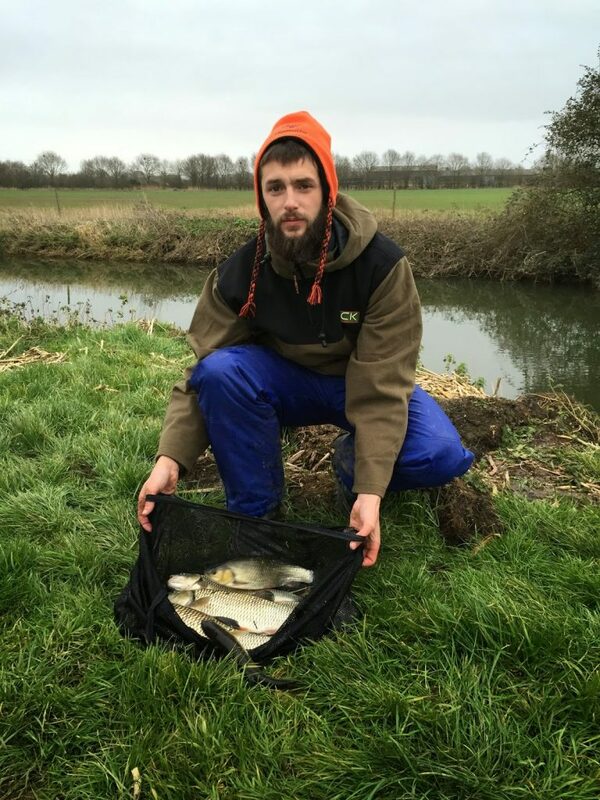 Justin won the bottom section with four chub for 7lb 6oz. Hurf did well catching 5lb 11oz from peg 123 but he still donated a quid to my piggy bank! 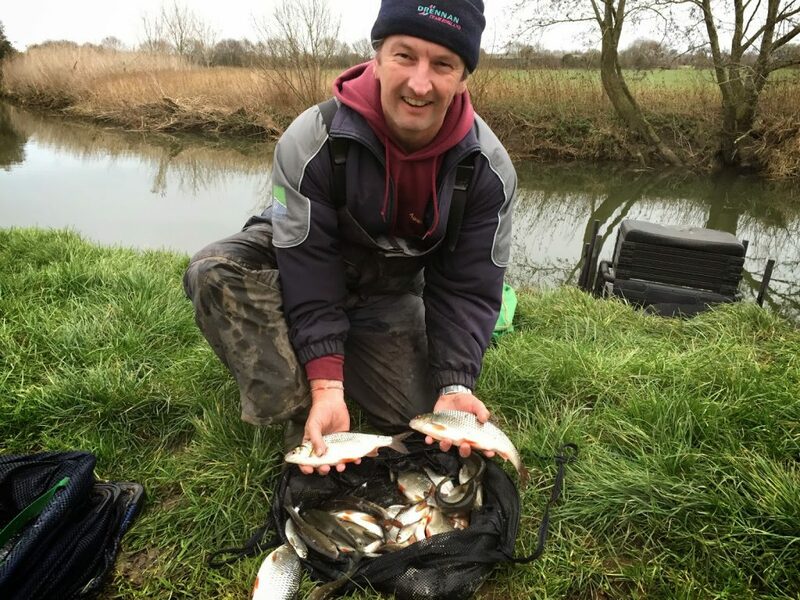 Heardy had two chub from peg 129 for 4lb 3oz and Neil Dring struggled for 1lb 7oz from peg 124 but he did have the choice of that one or 125 and I bet he wishes he’d chosen the latter now! It was a little surprising that only chub came off 128 and 129, where have those roach gone? I picked up £50 for winning and was waiting for my golden peg winnings when Rob checked the sheets and the golden pegs were 125 and 129! Oh well, I’d still enjoyed a cracking days fishing and it was nice to win my first match of the year. The league has tightened right up now, Heardy still leads with 10 points followed by Rob on 11 and me and Fieldy on 12, so with one match to go it’s all to play for.